No hot water in your business? Problems with your hot water supply are just never a good thing – but especially when your craft brewery, apartment complex, restaurant, hotel, spa, gym or senior living facility depends on that hot water to keep your customers happy and your doors open! So how does a business owner ensure a continuous supply of hot water and water heating equipment that is always up to the task? 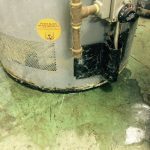 First – be aware of the early signs of water heater failure. They include excessive leakage or dripping water, visible corrosion around the pipe fittings, burn marks, a yellow flame color (instead of blue), the sound of popcorn popping or an overly loud blower motor. Second – only trust a trained technician to handle any water heater service calls. Water heater technicians and plumbers are not the same, and improper maintenance to your equipment can do serious damage. A trained water heater technician is immediately aware of the most suitable option and can source it directly. You’re out of hot water. As a decision maker at your business, you rely on your dedicated maintenance crew to fix all the little (and big) breakdowns that come with your day-to-day operations. But when it comes to keeping your commercial hot water supply steady and solid, there’s just no substitute for a trained water heater technician. I’m talking big savings in time and money – and that’s a must if you want to keep your operation running successfully.